Specimen of Pristiograptus, copyright P. Skupien. Contains: Cyrtograptinae, Linograptinae, Monograptus, Saetograptus. 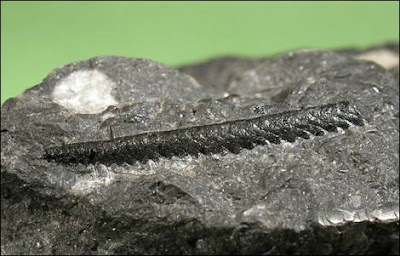 The Monograptina are a group of graptolites known from the Lower Silurian to the Lower Devonian, characterised by the production of a uniserial rhabdosome with thecae along one side only of the central stipe (Bulman 1970). Characters (from Bulman 1970): Scandent, uniserial; development monograptid, with sinus method of pore formation and initially upward direction of growth of th1. [BR70] Bulman, O. M. B., & R. B. Rickards. 1970. Classification of the graptolite family Monograptidae Lapworth, 1873. In: Teichert, C. (ed.) Treatise on Invertebrate Paleontology pt V 2nd ed. pp. V149–V157. The Geological Society of America, Inc.: Boulder (Colorado), and the University of Kansas: Lawrence (Kansas). [NJ83] Ni Y.-N. & Jiao S.-D. 1983. Lower Devonian graptolites from Yunnan. Acta Palaeontologica Sinica 22 (3): 295–307. [ZL97] Zhang Y. & A. C. Lenz. 1997. Uppermost Wenlock and Ludlow graptolites from southern Yunnan, China. Canadian Journal of Earth Sciences 34: 1220–1238.